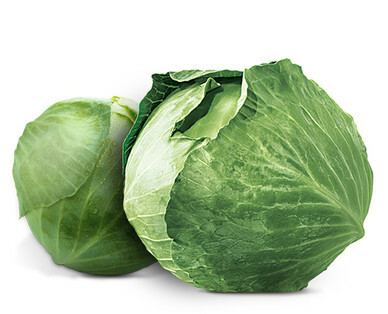 Cabbage has the fewest calories and least fat of any vegetable. Cabbage is also very low in sodium, which means you can enjoy your greens all day long. 1 cup of shredded cabbage is an excellent source of vitamin C. Vitamin C helps combat free radicals that may lead to diseases, such as cancer. Cabbage is also an excellent source of vitamin K, which helps regulate blood flow. People taking blood thinners like, warfarin, should not consume large amounts of this otherwise beneficial vegetable. Cabbage can be prepared in many ways. Toss thinly sliced cabbage in a vinegar-based coleslaw for a healthier side to sandwiches and burgers. Make a quick pickled cabbage and reap the benefits of fermented vegetables. Steam and stuff cabbage leaves for a Mediterranean-style meal. Purchase cabbage heads with compact leaves that are heavy for their size.